Your Complete Moving House Tips Guide! Moving house doesn’t have to be stressful. Compare My Move have compiled the ultimate moving guide featuring 15 of the best moving tips to successfully move house, the main do's and don'ts to remember, and a room by room packing guide. Once you’ve decluttered your personal belongings and have a rough idea of what you’ll be taking, now you should book your removals company. You could attempt to do it yourself, but it would be a lot of added stress and time. The removal company will have many years’ experience of carefully packing, handling and loading delicate and heavy items so they arrive safely at your new house. Decluttering is essential to do every now and then, but it’s even more important before moving house. Before even attempting to pack, you should decide what to sell, donate or throw out. By decluttering, you'll also keep your removal costs down too. Once you compare surveyors, get conveyancing quotes, and set your moving date, then it's time to start packing. Make a start on packing as soon as you can. Get together a plan of action with a room by room checklist of how you will pack along with all of the packing material you’ll need. Creating an inventory helps you to keep an eye on all your belongings to make sure nothing is lost throughout the whole moving house process. Your removal company can create an inventory for you if they have been hired to pack your belongings so this is also worth considering. It’s important to set up your utilities such as council tax, gas and home insurance early when moving house. Not only will this save you a lot of stress once you’re moved in, but you will have more time to settle in and relax in your new home. To save valuable time and money sorting your utilities out, make sure you use Just Move In. They will save you up to 8 hours of administration time setting up utility services. Arrange your utilities here. Usually, you’ll be able to buy quality packaging materials from your removal company, but you’ll be surprised what you can get for free. There are a plethora of different boxes you can get from removal companies along with the correct packing materials. You will also need packing tape, bubble wrap, zip tie bags, labels and marker pens. You should label boxes with the room it’s going to and a brief summary of what’s in the box so there’s no confusion when you’re unpacking. If you don’t want to write a short novella on the boxes you could consider using coloured stickers/labels to help categorise rooms. By keeping your cupboard and cabinet doors open in the days up to and on moving day will give you the chance to see that you have packed everything. This way, you will be able to see that you have everything or if you have left anything inside. You can do the same with the kitchen drawers. Pack the things you use every day and night in a separate bag and keep this with you at all times. Items such as medicine, face cream, toothbrush, toilet roll, change of clothes, phone chargers etc will all come in handy. Photograph the wires at the back of your television or any other electronic sets ups. This is a great way to keep track of what goes where when you’re putting everything back together in your new house. You can also take photos of any wall displays, ornament placement, or shelving setups in your current home that you are fond of and wish to recreate in your new place. You'll know your new home inside and out after your property survey, but what about the neighbourhood? Once the removal company is booked and you’ve started packing, go and spend the weekend in your new area, checking out the local pubs and shops. It’s a good idea to start changing your address with companies or organisations like the bank, the doctor’s surgery and dentist 2 weeks before you move. It is a good idea to start this with companies or organisations like the bank, the doctor’s surgery and dentist 2 weeks before you move. You can also divert any mail going to your old address with the Royal Mail for a small fee. Many people will forget about taking care of their council tax when moving house. If you’re moving to a new area, you’ll need to set up a new account. Check with your local authority for more details about your council tax band. If you have any items that need extra care when handling, such as antiques, pianos or valuable artwork, then your removal company will be trained to help. Professional movers have the experience needed to transport these items safely. One of the most common mistakes when packing is overloading boxes. If you reach a point where the box is half-full and starting to get heavy, then top it off with pillows or towels. If you are using a packing service from the removal company, they will supply the boxes and materials. If you’re doing the packing yourself, get creative. Use laundry baskets, suitcases and large hold all bags to make the most of space. Use packing paper, small items or towels to fill empty gaps in boxes. You could even use kitchen paper, tea towels or old rags. The idea is to keep your items securely in place during transit. A logical way to pack is doing room by room. Start with the rooms you use the least such as the garage, shed and spare bedroom. Pack items that are out of season first and keep out items you’ll use up until moving day. It’s important to know what your removal company will class as non-allowable items. Hazardous items like propane cylinders, paints, paint thinners and fireworks will not be allowed on the removals truck. Separate make-up in to liquids, creams & powders. Need a helping hand with packing? Boxing away everything ready to move house can be a nightmare. You may be left wondering where to get packing materials, how to keep an inventory, and how best to pack. Check out the articles and advice from the property experts at Compare My Move for everything you need to know about packing. 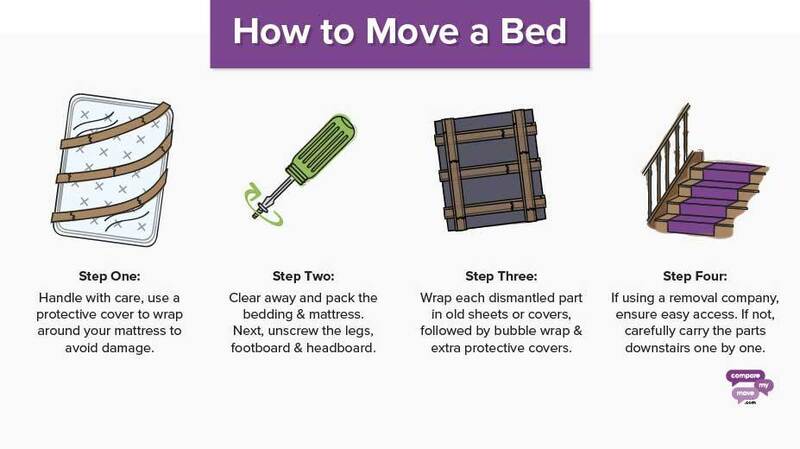 Moving and packing your bed doesn't have to be a difficult task. Follow these 4 simple steps for a stress-free move. Labelling your boxes is a must when moving house, many people often overlook this simple but effective task. Learn the best ways to label boxes here. The ultimate guide to packing and preparing your books for moving day, including a step by step guide on how to pack every type of book. 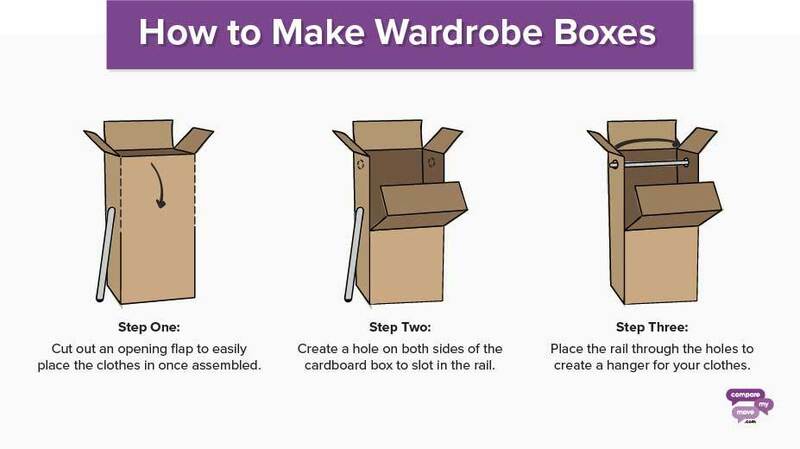 We've created this guide to show you how to make your own wardrobe box for packing clothes when moving house. Save money with this moving hack. Compare My Move provide 8 top tips on how to bring your plants with you on moving day. Moving a piano without using a removal company doesn't have to be difficult. Follow our step by step guide to safely move your piano when moving house. 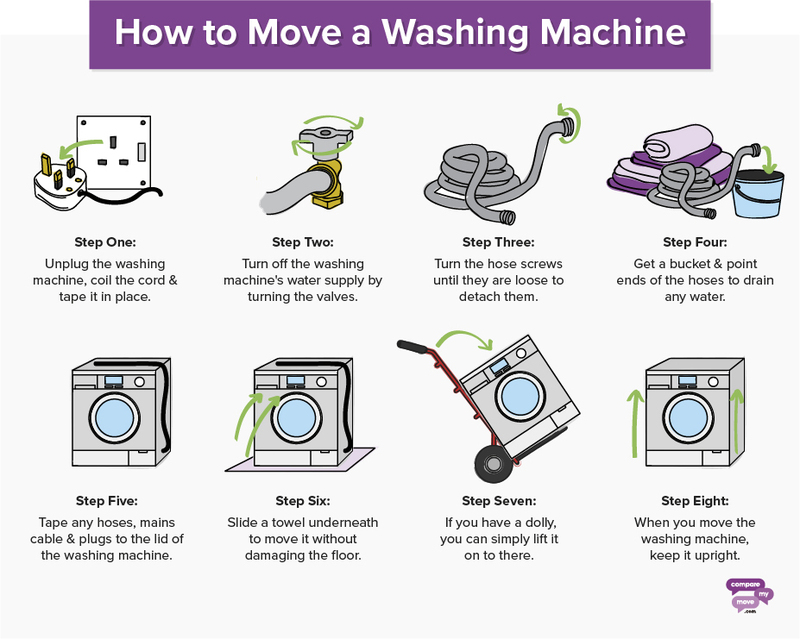 We've compiled the ultimate guide to help you safely move every kitchen appliance to your new house. 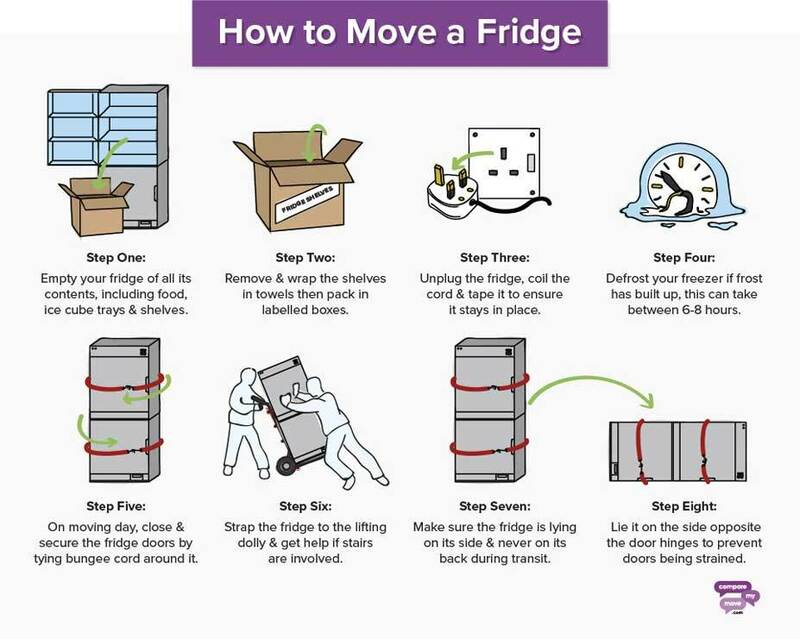 From how to move your oven to moving your fridge, we've got you covered. We've put together 6 of the best places you'll be able to find free cardboard boxes for your move along with a step by step on how to seal your boxes to minimise damage when moving house. Smaller items like shoes can sometimes take the most time to pack and move, and if not done right, they can end up damaged. Follow this guide to ensure you take the right steps to pack and move your shoes. Moving home can get very expensive as the costs mount up. These 10 money saving tips will help you save on the costs of moving house.